It’s not an exaggeration to say that everyone can find their happiness in San Diego. Young, old, thrill-seekers, curious minds, sports buffs, culture vultures, poolside loungers and spa seekers — San Diego has it all, all year-round. Whether you’re looking to squash screen time and tire out the teenagers or just relax on the beach and reconnect as a family, San Diego was made for the all-ages vacation. Visitors come from around the world to commune with the creatures at the San Diego Zoo and its sister Safari Park. (Insider tip: go early in the morning just as it’s opening to see animals at their most active and avoid the afternoon heat). With thousands of rare, endangered, and amazing creatures between them, it’s easy to see why. 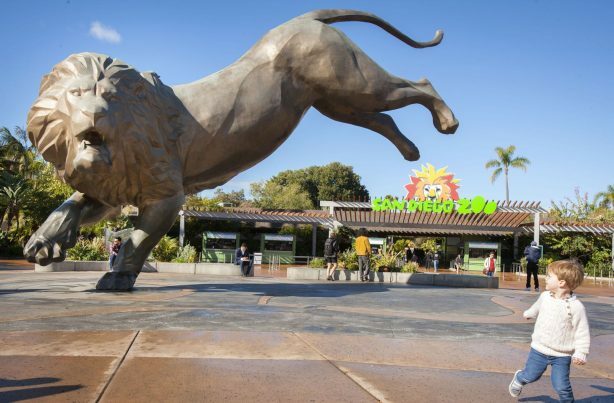 The 100-acre San Diego Zoo houses 3,700 animals, and the Safari Park another 2,600. And these places are just the beginning! San Diego boasts an abundance of theme parks, museums and attractions spanning a range of interests. Smack in the center of town, Balboa Park alone houses 17 separate museums of art, natural history, science, air and space, anthropology, photography, automobiles, and more. The city’s waterfront shelters the maritime museums of the USS Midway Aircraft Carrier and the Star of India — two jaw-dropping ships with very different histories on the high seas. Kids of all ages earn their wings, literally, after completing the Midway’s extensive audio tour. Farther north, The Birch Aquarium provides a peak at what lies beneath the surface of San Diego’s briny margins, as well as interactive exhibits on climate change and some of the most stunning views of the La Jolla coastline (insider tip: pack a picnic for the kids to enjoy on the outdoor patio). For pure fun, nothing beats LEGOLAND,especially for kids under 12 years old – even the roller coasters and other “thrill rides” are safe for toddlers here. Belmont Park’s throwback rollercoaster and modern carnival-style thrills. Seaworld San Diego is also home to new roller coaster rides and its sister spot Aquatica (note that it’s about 20 miles south) provides acres of relief from the heat with water slides and splish-splash fun. Outside the zoos and aquariums, it’s easy to find animals in their natural habitat. In San Diego, that’s as simple as heading to the beach. At low tide (which occurs during the day from November through March), the rocky shores of Cabrillo National Monument becomes a tidepool wonderland. Under the water, you will discover anemones, barnacles, mussels, sea stars, urchins, and other creatures of the not-so-deep. To boot, the national monument, located at the tip of the Point Loma peninsula, offers an unparalleled view of San Diego Bay, the downtown skyline, and the mountains beyond. In La Jolla, just strolling the promenade along the cliff-lined coast brings you within feet of portly seals and sea lions, particularly at the Children’s Pool and La Jolla Cove, where the pinnipeds have permanent colonies and can be seen sleeping, swimming, and clambering around day and night. From the shore you can also get glimpses of dolphins and whales, although the best way to see them is to take a whale-watching tour, of which many kinds are offered in San Diego’s waters. Those willing to get in the water can swim with harmless, 6-foot-long leopard sharks or a colorful garibaldi, the official state fish of California. Located in the path of the Pacific Flyway and boasting dozens of wetlands and wildlife refuges, San Diego provides free and easy access to area wildlife. Traveling with kids doesn’t mean foregoing San Diego’s epic food. Most hotels and resorts offer kid-friendly cafes and beachy picnic fare. But local neighborhoods also offer plenty of farm-to-table food with a nod to the little ones. At Waypoint Public in hip North Park, kids can burn off burgers and fries in a play area stocked with toys, books, and pillows. La Jolla’s Farmer and the Seahorse sports a green turf lawn and provides corn hole, hula hoops, soccer balls, and Frisbees. Locals flock to its Sunday brunch which often boasts live music, too. Adults love The Crack Shack for its epic fried chicken and salads; kids can order nuggets and cruise through the bocce court, sand pit and (at the Encinitas location only) a mini golf course. The Corvette Diner let’s kids party like it’s 1950 while poodle-skirt clad servers and arcade games bring the mid-century vibes. Save room for sweet treats, like a multitude of goodies at the Old Town House of Jerky & Root Beer (where a mind-boggling array of jerky and root beer types are available) or at nearby Cousin’s Candy Shop, well stocked with a rainbow of sweets. Locals also flock to Caroline’s Seaside Café for pancakes, acai bowls, and BLATs (the A is for avocado) served up right on the beach in La Jolla. Parents can enjoy a second cup of coffee while the kids play in view on the grass below. Balboa Park’s kid-friendly Fleet Science Center shows IMAX films and hosts permanent and limited exhibits touching on nearly everything in the universe including volcanoes, space, dogs, electricity, and water. Wee lads and lasses can blow off steam at boutique indoor play center Kid Ventures, with a location in Liberty Station. Learn about California’s rare coastal waterway ecosystems plus eco-friendly building techniques at the San Elijo Lagoon Nature Center. Little ones become artists and creators themselves with The New Children’s Museum’s interactive exhibits, workshops, and educational installations. For the family looking for hiking and nature in the inland valleys, don’t miss the Mission Trails Regional Park. The Nature Center exhibits the native flora and fauna of San Diego’s foothills, offers simple crafts projects for kids, and offers parking for some of the region’s most popular trailheads. Visit the studios of more than 200 painters, sculptors, metalsmiths, and other artists at the Spanish Village Art Center. Daily demonstrations including glass blowing are a big draw to this enchanting spot in Balboa Park adjacent to the San Diego Zoo. The Marie Hitchcock Puppet Theater’s live weekly puppet performances are a smash hit with wee ones. A dose of more sophisticated performance art can be found on the stage of the renowned La Jolla Playhouse, a perennial draw for actors from Groucho Marx to Kim Cattrall. The San Diego Model Railroad Museum — the world’s biggest museum of its kind — is a must-see for the train-obsessed. Get their little feet wet in the sport of surfing with lessons — the waves are conducive to learning how to paddle, pop up, and ride waves most days of the year. Harness the power of the wind with sailing classes, offered in a variety of small sailboats (kayaks and SUPs, too) in both Mission Bay and San Diego Bay. Kids can tee up at Del Mar Golf Center, home to mini golf or learn to Kayak at the Mission Bay Aquatic Center. Young shredders will know San Diego as a breeding ground for skaters of all stripes and, accordingly, the skate park scene does not disappoint. Between public parks and facilities, the region hosts dozens of top-quality parks with bowls, vert, mini-ramps, ledges — you name it. Whether along flat, mellow beachside paths or mountain trails or roads, a lifetime of cycling awaits in San Diego. No matter where you are in San Diego, you’re never far from the beach. With 70 miles of ocean coastline, there’s a patch of sand made for every age and stage of vacationer. The cliff-lined stretch north of La Jolla makes for dramatic scenery and a fun, easy hike through Torrey Pines State Natural Reserve. Just south, you’ll find La Jolla’s rockier beaches exposed at low tide, great for tidepool exploring and close contact with crabs, anemones and other sea life. Farther south lies La Jolla Shores wide, sandy beach and walkable village with restaurants and rentals. San Diego’s several public piers and boardwalks also make for breezy strolls and a fine place to watch pelicans and surfers ply the waters. Crystal Pier in Pacific Beach is the most central, with plenty of shops (both retail and ice cream) nearby as well as rental outlets for bikes and beach toys. And the sandy beaches of Mission Beach, Coronado, Oceanside, Moonlight Beach, and Del Mar beach, which often stretch on as far as the eye can see, promise hours of body surfing, building sand castles, playing paddle ball, reading, and otherwise soaking up the sand and sun. Lifeguards staff most the beaches from sunrise through sunset in the summer months. And most have bathroom and shower facilities. Parking can be tough in the summer, so allow extra time (and pack your patience). Mission Bay sports an additional 27 miles of park- and beach-lined shoreline along calm water (no waves or surfing here) as well as a dozen miles of paved, flat paths perfect for bikes, scooters, strollers or just an easy jog at sunset. East Mission Bay’s grassy knolls are known by locals as “kite field” for the great gusts and open grass areas. Didn’t pack your own kite? Watch the many locals who come to fly high on weekends. They might be the most iconic sight in San Diego. So be sure to take in at least one sunset during your visit. Pack a picnic and snag a spot on any one of the sandy beaches or these special sunset spots. To make it an epic evening on the water, snag a firepit (Ocean Beach and Mission Bay have the most pits) and grab the s’mores essentials for a family-friendly bonfire. Beware that alcohol is prohibited on most beaches in the city of San Diego. San Diego has a rich history dating back thousands of years. All of its various chapters are on display for curious minds at museums around the region. Learn about the Kumeyaay, the native people who inhabited the area for thousands of years before the Spanish arrival, and continue to do so at the Junipero Serra Museum, the site of the first Spanish mission in what is today California. Old Town San Diego State Historic Park, known as the birthplace of California, houses historic exhibits, Mexican artisan shops, top shelf margaritas and festive restaurants and even one of America’s most haunted museums. Conveniently, Old Town is one of the stops on San Diego’s entertaining and informative 25-mile trolley tour that stops at 10 different neighborhoods. Old and young salts alike will take to The Old Point Loma Lighthouse at Cabrillo National Monument, which first shined over San Diego Bay’s entrance in 1855. You can tour the old lighthouse, wade through the tidepools, or bring binoculars in the late winter and late summer to catch the spouts and flukes of gray and blue whales migrating off the coast. While San Diego’s beaches, attractions and restaurants are hugely kid-friendly, there’s a distinctly adult side to the city, too. So whether the kids are in summer camp or with a sitter for a few hours, moms and dads can easily relax and enjoy their time off, too. San Diego is home to award-winning spas and wellness centers perfect for quiet time, as well as next-level dining experiences like Richard Blais’ Juniper & Ivy restaurant or the Omakase-only sushi spot Hidden Fish. George’s Ocean Terrace is perfect for a romantic lunch or sunset dinner for two; or hit the nightclub scene in the Gaslamp Quarter for some jumping adult playtime. This entry was posted in Family Vacations by San Diego Magazine. Bookmark the permalink.